IBC (Intermediate Bulk Container) is a generic term used to describe a reusable industrial container (IBC containers), designed for the transport and storage of bulk liquid and granulate substances (e.g. General chemicals, Speciality Chemicals, food ingredients, solvents, General liquids and Dry goods, pharmaceuticals, coatings, paints, resins, lube oil, lube oil additives, spirits, dairy products, etc.). Intermediate bulk containers are stackable containers mounted on a pallet frame that are designed to be moved using a forklift or a pallet truck. IBCs have a volume range that is situated between drums and bulk tanks, hence the term "intermediate“. Intermediate bulk containers are known by many names in the packaging industry such as , IBC, Tote, Tote Tank, Pallet Tank, Pallet Box, liquid Box, Mini Tank, Bag in Box, Folding box etc. 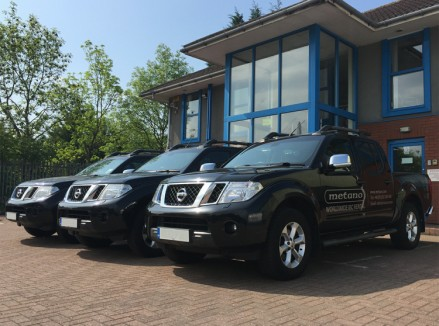 Established as a rental company in 1991 with its engineering heritage dating back to 1946, Metano is a well established and trusted rental partner across all industries and with a global reach. Environmentally conscious, Metano operates a large rental fleet of standardised re-usable IBC's internationally complete with all operational support services including an in house design capability providing solutions for most industrial sectors. From its base in the North East of England, Metano is providing a quality service to global customers. Privately owned and privately funded, Metano is well placed to respond quickly to customer requirements both now and for future demand.